Breakfast was not included in my deal at the W Hotel in Times Square. 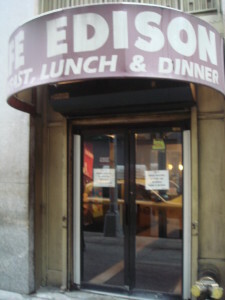 If it had been, I would never have discovered the Café Edison. To have missed this iconic Broadway eatery would have been to miss a quintessential piece of New York. Housed in the former ballroom of Edison Hotel, at 228 West 47th Street, in the heart of Broadway, the café’s mirrored bar and booths with benches sit under a vaulted blue ceiling and between pink walls busily embossed with white. Added to this is a pastiche of posters, homey art works that look like the oeuvres of some rising family star, fragments of menu, advertisements and framed newspaper article that proudly blow the trumpet of this theatre world landmark. Theatre patrons, stage-hands, actors, producers and playwrights all congregate here. Plays are conceived and written here. 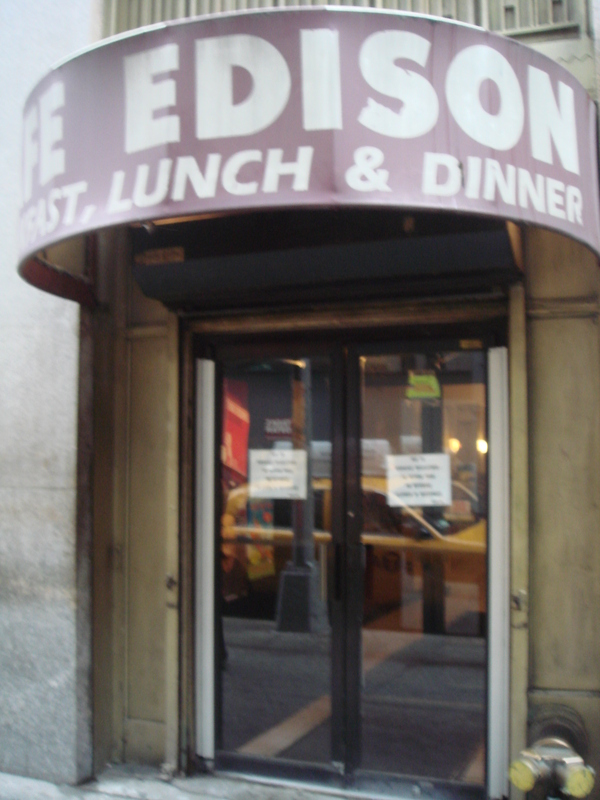 August Wilson dashed off the notes for three of his scripts on Cafe Edison napkins. Neil Simon’s comedy, 45 Seconds From Broadway is about this café which he claimed as his second home, whose staff he embraced as his family and where he could always be found at his special, reserved, cordoned off table, just inside the front door. Big theatre deals are clinched and important Broadway decisions, like who’s up for a Tony, are thrashed out at the Café Edison’s tables. The café is also known as the Polish Tea Room, which according to N.Y.C. lore, is a nod, or rather a dig, at the prestigious, expensive and now long-gone, Russian Tea Room. But it is also, surely, a tribute to the Café’s Polish founders Harry and Frances Edelstein and to the legendary Polish Jewish cuisine that the Edelstein family have turned out over two generations. The menu includes Latkes, matzo brei, borscht, stuffed cabbage, corned beef, pastrami, lightly fried blintzes stuffed with sweetened cheese, blueberries or cherries, giant open-faced reubens, kasha varmishkas, mazzo brei, an assortment of soups, including, according to Condé Nast Traveler, “the best matzo ball soup in town” and fabulous breakfasts with eggs “over easy” and endless coffee. Wielding the coffee pots is a gaggle of waitresses of an appearance, age and style that strongly reminded me of an already dated sit-com called Alice which I watched every day during at 1.pm during the summer of 1983 while I breast-fed my newborn son. Other reviewers have described them as “short”, “rude”, “crabby” and “off-hand”. But to me, they had the weary, long-suffering, matter-of-fact, business-like demeanor of working mothers with jobs to do, mouths to feed and messes to clean-up before they could get off their feet. So, cups were filled, toast was replenished and extras added to meals without fuss or favour because they knew, or seemed to, what all their customers needed before they did themselves and it wouldn’t have surprised me in the slightest if they’d slapped some hands and wiped some chins into the bargain. Don’t miss the Café Edison on your New York adventure, it’s worth it for architecture, the people watching, the exceptional (though not in the conventional sense) service and absolutely unreservedly for the food.